President Macron led a chorus of outrage against yellow-vest protesters who screamed antisemitic insults at a 69-year-old philosopher. 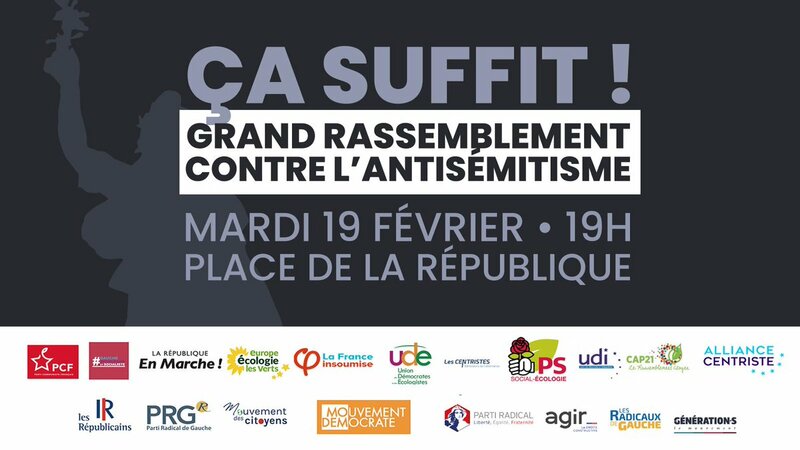 The abuse of Alain Finkielkraut in Paris was the latest antisemitic act to mar the Saturday marches by the movement, which began in November as a rural uprising against Mr Macron. Mr Finkielkraut, a member of the Académie Française, France’s most august intellectual body, and an initial supporter of the yellow vests, was called a “dirty Jew” and “bloody Zionist” in video broadcast on television. Mr Macron tweeted: “The antisemitic insults that he has been subjected to are the absolute negation of what we are and what makes us a great nation. We will not tolerate it. His abusers appeared to have been a mixture of old-school, far-right antisemites and people from the banlieues who supported the Palestinians, he said. “I’d be surprised if these were original yellow vests because I was one of the only intellectuals to have supported the movement at its start,” he added. Some 5,000 people protested in Paris and 41,000 in the rest of the country on Saturday, down from the total of about 300,000 in November. During protests in Lyons a police van was attacked. Hundreds took to the streets peacefully in central Paris again yesterday. Christophe Castaner, the interior minister, said the Lyons attackers would be found. He said that at least one of the men who abused Mr Finkielkraut had been identified and would be arrested. Many in politics condemned the verbal attack on Mr Finkielkraut, who was escorted to safety by police. Hard-left politicians, whose figurehead is Jean-Luc Mélenchon, leader of Unbowed France, withheld criticism, with some dismissing the event as “fake news” because they said the crowd had been denouncing Zionism, not Jews. Benjamin Griveaux, the government spokesman, said that the words “dirty Jews” were clearly heard. “The abuser is audible and identifiable. Denying and defending these insults is disgraceful,” he tweeted. Many supporters of the yellow vests disown the racial hatred that has emerged in protests in recent weeks but most of the movement’s self-styled spokesmen remained silent yesterday. Libération, the left-wing newspaper, asked leading figures in the movement “to publicly dissociate themselves from the fools who are staining them and the country”. A survey by Ifop last week found that 44 per cent of people who identified themselves as yellow-vest supporters believe that a global Zionist conspiracy manipulates the world. That compared with 22 per cent of the wider public. Many protests have featured banners and chants claiming that Mr Macron is a “puppet” of Jewish masters. Antisemitic acts rose 74 per cent last year, the government has said. Sympathy for the yellow-vest movement remains strong but patience with the often violent Saturday protests is wearing thin. An Ifop-Fiducial survey for Le Journal du Dimanche suggested that 11 per cent of the French identified as yellow vests, compared with 16 per cent a month ago. Fifty-two per cent of the public wanted the protests to stop, compared with 38 per cent who wanted them to continue. Mr Macron seems to have recovered somewhat after a low point in December when the protests had him on the defensive. His approval rating has risen by some six points to about 38 per cent. I have read Finkielkraut, apart from his – hard to avoid – journalistic articles I have one of his books, L’Identité malheureuse, 2013. It is a cut and paste job, from a wide variety of books and newspaper cuttings (about education, crime, arab racism towards non-Muslims, low educational standards, Melanie Phillips style). I would not say he’s much of a ‘philosopher’. I don’t read the Times, pay-wall. He expressed stupid enough views as it was! Conscient de l'instrumentalisation de l'antisémitisme, je crois aussi qu'il ne faut jamais laisser passer le racisme. Autour de #Finkielkraut, il y avait aussi des #GiletsJaunes qui voulaient le défendre et s'opposer à l'attaque. Je suis avec eux. Sounds a bit like the Labour Party conference.